10 Silicone Star Shaped Cupcake/Muffin/Soap Molds Only $4.19 + FREE Shipping! You are here: Home / Great Deals / Amazon Deals / 10 Silicone Star Shaped Cupcake/Muffin/Soap Molds Only $4.19 + FREE Shipping! These would make really cute cupcakes/mini cakes, or even handmade soap! 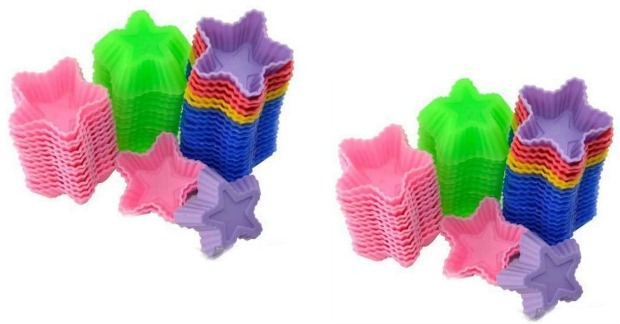 Grab this Set of10 Silicone Star Shaped Cupcake/Muffin/Soap Molds for only $3.39 + FREE Shipping! – 100% brand new. Commercial level quality, durable, reusable, non-stick, non-toxic. – Microwave and freezer safe. Easy to use and clean. – Suitable for cake, cupcake, chocolate, jelly, ice cream, soap etc. – Material: High Quality Food Grade Silicone. Compliance with FDA/SGS. – 10 pieces per lot. – Color: We don’t offer color choice. Your order will be sent in colors at random. – Temperature: -40F to 446F (-40 ?~ +230 ?). Add on facebook says 3.39 with free shipping and then come over to order and there over five dollars plus shipping. What a fraud. The post states that prices change quickly on Amazon, I have no control or notice of when they might change. When this was posted they were the price stated in the post.